Wouldn’t want anyone to miss this gorgeous photo of Pluto, shot from 1.2 million miles away by the departing New Horizons spacecraft. 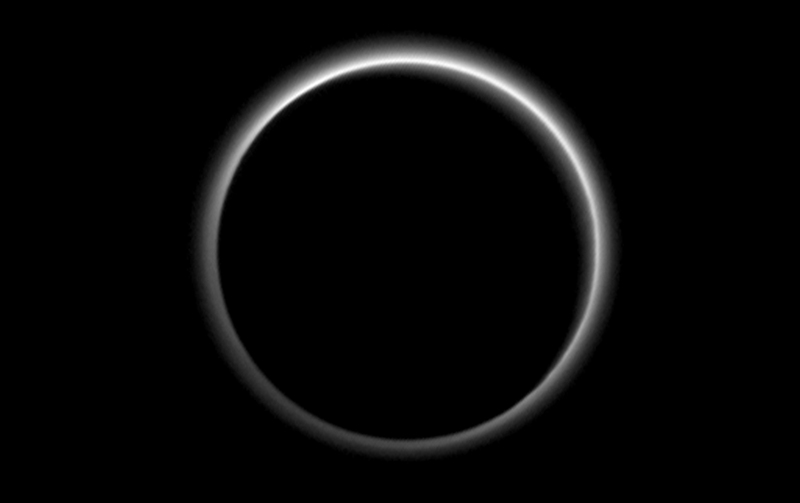 The glowing ring is light passing through Pluto’s atmosphere, not a solar eclipse. A Slate article explains the science and includes several more photos. Thanks for posting – fascinating. Someday, in the distant future, I can imagine pictures and data coming back from robots sent to (relatively) near-by Earth-like planets. They would be launched to slingshot around the sun and then deploy solar sails. I’m very frustrated I won’t be around for it. I share your frustration. We’re the Star Trek generation; we’ve dreamed all our lives of traveling to the stars. But it’s come too slowly and we’ll not see it. Huge disappointment to do so much of the groundwork while knowing we’ll miss the big payoff(s). I realize science is incremental and precise but I’d like to have seen either a colony on the moon or men on mars. It is incredible seeing real photographs of the dark side of Pluto, not artist conceptual drawings, plus being told these are low res & HD images are being sent from the hard drive. This technology existed to think of, pitch the project, plan, design, and launch New Horizons. (comparing moon images from the Apollo missions—the image quality is nowhere as sharp or detailed as these) It makes me even more curious what Star Trek/Star Wars technologies they have ready in the queue! Don’t give up on dreaming– true, WE won’t visit other worlds ourselves, but without a comfy touristy experience, would we really want to make the trip? I wouldn’t have survived the Santa Fe Trail in a covered wagon, let alone a visit to another world 🙂 Thanks for posting this one! Heh, yes, I’ve often marveled at those who crossed the Great Plains on foot or wagon or horseback. I can barely stand it in a car. But no, I’ve not wished to travel to other worlds myself; I’d just like to be around to see us reach one. I’d have been happy seeing routine travel to a moon base.
. . . I’m still hoping for passing aliens to take pity on my plight and take us far away from here . . .
Any particular place you’d like them to take you? Away from the things of man. Away from the things of man. Well, it’s a big universe … Lots of options out there. That’s the problem . . . they are taking their sweet time getting here. Wonderful stuff. Truly amazing how our knowledge grows and grows, and yet there is so much more out there to learn. We’ve barely scratched the surface. Exciting, isn’t it?